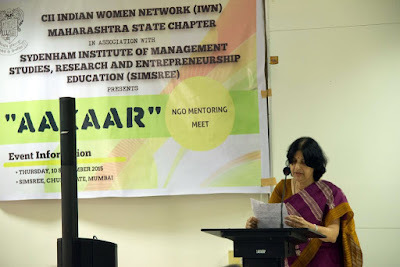 The Indian Women Network (IWN) wing of Confederation of Indian Industry (CII) in association with SIMSREE and Women’s India Trust (WIT) organized an event named ‘AAKAAR’- NGO mentoring meet, on 10th September, 2015 at SIMSREE. The aim of the event was to invite Self Help Groups (SHGs) run by women making products like handicrafts, torans, kurtis, imitation jewelry etc. and present to them various marketing and financial alternatives along with some product development ideas which can enable them to scale up their business. National Institute of Fashion Technology (NIFT) as well as EBay also extended their support for the event. 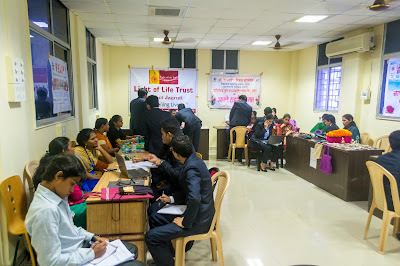 The event had participation from 16 NGOs who came from Mumbai and the nearby areas including Karjat and Mahad. The Student Social Responsibility (SSR) Committee along with more than 50 student mentors from SIMSREE will be actively working with the NGOs over the period of 1 month to ensure proper implementation of the plan suggested during the event. The event saw an active participation from the industrial world. Ms Pallavi Jha, Chairperson, CII IWN and Chairperson and Managing Director of Walchand Peoplefirst Ltd. with her welcome speech inaugurated the event. This was followed by the speech of Ms Shyamala Nath, CEO – Women’s India Trust in which she praised the women NGOs for their courage and determination. Dr.Manoj Bhide, Director, SIMSREE and Ms Sangeeta Pandit, HOD, Finance also addressed the gathering thanking all the concerned teams for their presence in the initiative. A special presentation was done by Mr. Abhay Bhat, Head of Seller Services, India, EBay. Mr. Abhay helped the audience understand the Ecommerce selling process, encouraging the NGOs to list their products online in order to attract more customer base. SIMSREE students also presented on the basics of business finance and marketing, giving the details on how potential markets can be tapped and business processes can be made more efficient. Ms Monica Lakhmana, Founder, Monica Lakhmana Foundation concluded the first half of the event by focusing on the possibilities that the session provided and also by thanking everyone for their contribution. 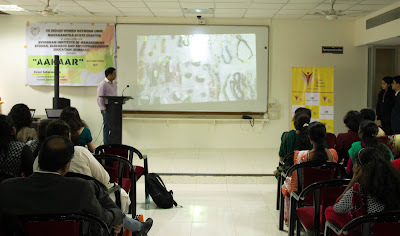 The second half of the event had a session where in students from NIFT and SIMSREE interacted with the NGOs. The students from NIFT focused on the product development perspective. Groups of students from SIMSREE were assigned specific NGOs and the interaction helped the students understand the NGO allotted to them along with their limitations and growth opportunities. The students suggested them financing and marketing strategies based on the interactions with NGOs. It helped the NGOs to not only develop a completely different perspective about the local market and its opportunities but also learn digital marketing. The SSR committee along with the help of the student mentors from SIMSREE, under the guidance of Prof. Sangeeta Pandit, will assist the NGOs in implementing the ideas, over a period of the next one month.To summarize, it was a great interaction between the corporates, the NGOs and the students of SIMSREE. Dorset based plumbing and heating company servicing local homes and businesses. Forging a Healthier World - Starting with you. Fitness, weight loss, strength building and martial arts, all under the one roof. Enjoy a friendly culture, expert advice and real world results. bodiku is a fitness management company offering a variety of online and personal training services in support of a healthy and balanced lifestyle. The company’s International Team is headed by World Champion athlete and Performance Nutrition expert komang ARNAWA. Concrete techniques specialises in terazzo flooring, all epoxy flooring and high quality industrial waterproofing. We use quality sika, hychem and tam products. For any enquiries please contact admin. At Tiento, we specialise in tile, stone and design offering a wide variety of contemporary options to suit your needs. BigStew provides everything that you need for your next relocation. We help you move your stuff anywhere around or in Australia. Angels-ad-pbb.com is the world leading classified website that facilitates businesses for an easy access and visibility in today's Global market. Everything is free. Register today and start blasting your online presence and sky rocket your profit and dominate your competitors. Oracle RAC Training in Al Karama, Dubai.